If you all like me on Facebook, you probably know that I've been in a bit of a rug dilemma lately. I had this weird urge to suddenly change out the rug in my living room. I really love the rug that's currently in there, it's just that it looks gross. From far away, it's beautiful, but up close...ughick. That's a ugh and an ick together :) Plus, it was really high pile. Was being the key word here. Since this area gets a ton of traffic, that high pile has been smashed down as low as it can go. And so of course, all the dog hair and crumbs gets even harder to clean up since that gets smashed down there too. Super fun :) Plus, I've been wanting a larger rug for this area anyway. So the search began. Well, the search for the first rug. There's a second rug to go. I've been wanting a rug for my bedroom too. So, I've been on a crazy high search for large very inexpensive rugs. I tried to stay under $150 for my budget. 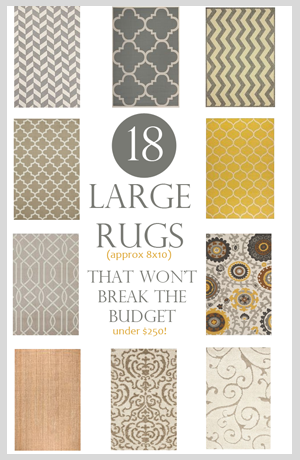 So, most of these rugs are around that number, some even cheaper. But, some rugs are just too beautiful and it may be worth spending a little more :) So, here's what my search came down to. 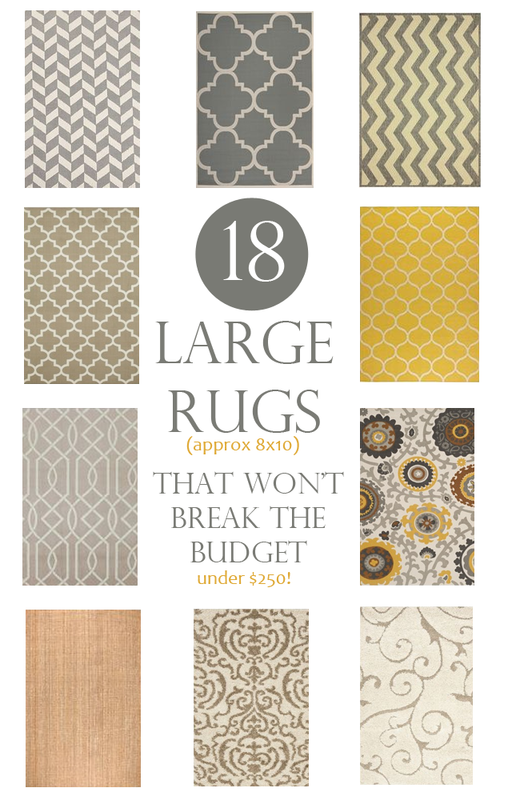 All of these rugs are currently (as of today) listed under $250, most of them under $200. 2.The Shaw Living Medallion Area Rug. It's a 8x10 for $179.99. I have seen this rug in store and I think it's one of those rugs that if you see from afar, it's beautiful like in the picture. But if you get down and look at it, the fibers are a little more separated than I would wish; it's more of a shag rug style - a little higher pile but not much. If you go to the website and zoom in, you can kind of tell what I'm talking about. This rug has been on my list to replace my current living room rug, I just don't know if I want another high pile rug :) But at least the fibers are different, so that's helpful. 3. The Tarnby Rug from Ikea. It's 6'7"x 9'10" and is $149.00. This is an awesome jute rug. Not soft at all, so keep that in mind. I actually have this rug under my dining room table right now, I liked it so much I thought about getting a second one for the living room. This would be the rug to get if you don't have children and pets laying around on it all time :) Although, the babe crawls under the table on this thing constantly, so it doesn't seem like she really minds. Click here to see it in my dining room. 4. The Stockholm Rug from Ikea. It's 5'7 x 7'10" and is $199. It's the smallest rug here but I can't get over the color and pattern. It is a low or might even be no pile rug also and would probably never match my house either. But sometimes, I really like yellow and really like the idea of putting yellow in my house. The best part is that this 'yellow' is really a deep hue so it's not too overpowering. 5. 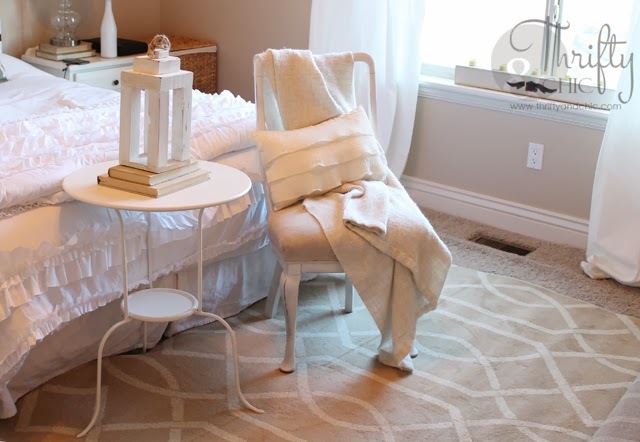 The Safavieh Cream and Beige Area Rug. It's 8'x10' and is $234.89 currently on Amazon. I can't tell you how much I love Safavieh rugs. I own one right now (rug #6) and love it. It's medium/pile and super soft. This was actually the rug I was going to get for my bedroom when I found rug #6 instead. I'm still thinking this might be a contender for the living room. 6. The Safavieh Shag Rug (it doesn't really give a good name other than that but the number is SG462-1113). It is an 8x10 for $247.49. I own this rug and love it. As I said before, it's super soft. I haven't had it for very long, so I can't account for the wear and tear. It's true to color, and I might say looks better in person.You see more of the cream than the brown in person. Here's the picture of what it looks like in my bedroom. 8. The Herringbone Rug from Urban Outfitters. It's 8x10 and is currently on sale for $169. It comes it 4 colors: Aqua, Grey, Navy and Mustard. I think if I wanted to take my living room to a more modern feel, this would be the rug to do it. Chevron is going out and my feel is that Herringbone will stay for awhile. This is a cotton woven rug, so it's has no pile. Here's the rug in my bedroom. The color actually appears a lot lighter in this pictures. It's a little bit darker than this. but you can see the color difference already compared to the picture above. 10. The Mohawk Home Hampton Woven Area Rug. 8x10 for 149.47 currently on sale...at Walmart...again :) I bought this rug when rug #9 kept getting cancelled on me. I bought it in the beige color which is almost true to color, maybe it's a little lighter than what shows online. But, the design on this rug was way to large. Way way to large....at least for me. When I put it under my sofa and ottoman, you could barely make out the design. And it made me feel like it was in a furniture store for some weird reason. Not for me, but it was probably the beige that threw it off. This slate color is beautiful. It has comes in 4 different colors. This is also low pile and super soft, softer than rug #9. 11. Mohawk Home Elegant Lattice Woven Rug. It's an 8x10 for $149.47 from Walmart. Also, another rug I bought while rug #9 got cancelled. I may have been obsessive but I was really wanting a rug lol. This rug is actually quite pretty, and doesn't seem at all as the pictures makes it look. You have to imagine this rug on an 8x10 scale. It's the perfect amount of pattern...and doesn't look dizzy or blurry either like the pictures shows :) It's the same quality as the two rugs above. 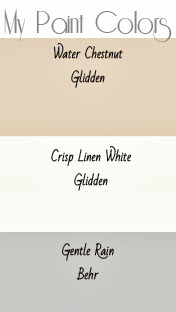 The color beige is once again not like the color shown and little more goldish. This comes in two colors, beige and the slate above. I forgot to take a picture with it under the furniture, but here it is next to my current rug for reference in pattern size. This color still isn't quite right compared to it in person. But you can see the difference compared to the current rug that is more of a grayish brown compared to this goldish brown. 12. The nuLOOM indoor/outdoor Vertical Chevron Rug from Overstock. It's 7'10x10'10 for $170.99. 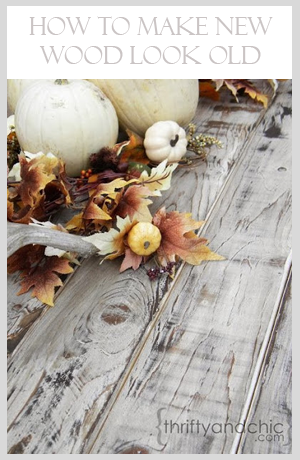 I just love the vertical chevron pattern on this, and the grey of course. It's a no pile woven rug, so perfect for indoor and outdoor. 13. And if the other style of chevron tickles your fancy, then go for the nuLOOM Modern Chevron indoor/outdoor rug. Also a 7'10x10'10 for $178.66 from Overstock.Comes in grey and blue. 15. The Safavieh Indoor/Outdoor Courtyard rug. 8x11 for $195.99 on Overstock. I love the pattern on this rug. I have this earmarked for a great rug for my outdoor patio. 17. The Safavieh Indoor Outdoor Courtyard Rug, 8x11 for $190.79. I like this rug since it's like rug #16 but smaller scale :) This is also a contender for the patio, but would be a contender also for the living room if I could find it in a lighter color. 18. The Safavieh Hand Loomed Cedar Brook Citron/Ivory Cotton Rug. It's 7'3x9'3 for $194.99. 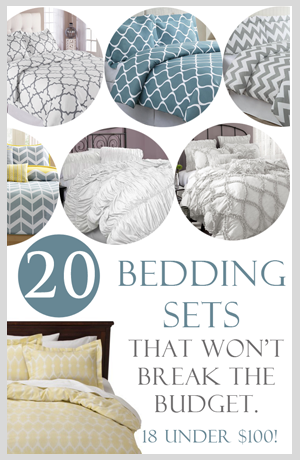 Who doesn't love a little pattern? If I were to go with color and pattern, this would be the rug I would choose. I'm completely drawn to it for some reason. Love it. And that's it! All 18 of them. I hope that my crazy obsessive search for a rug has helped you if you are searching. 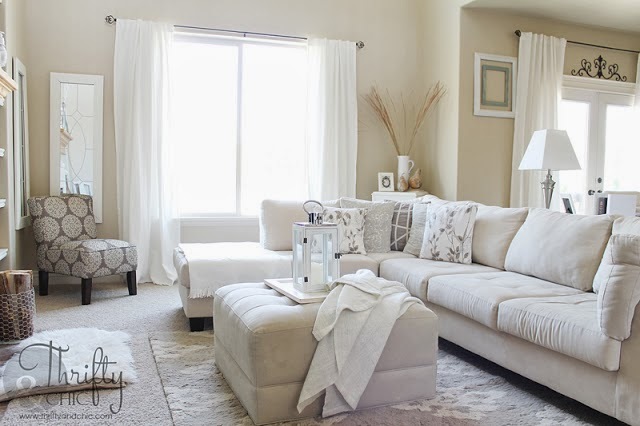 I can't stand paying a lot for rugs...and it's hard not to when you want a large rug. But, I think I found some good contenders :) Stay tuned for what I finally decided on!! 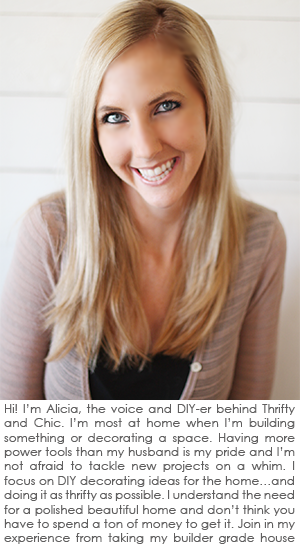 Follow me on Pinterest as I will be pinning more and more reasonably priced large area rugs. Thank you for a most welcome and helpful post! 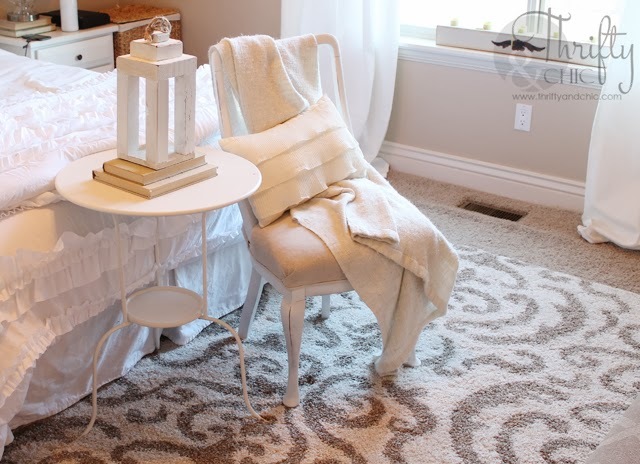 I love most of these rugs and had no idea they could be had so inexpensively! And, I love your blog. Thanks for everything! Thank you Tina! It takes some time to research, but there are actually quite a few large rugs out there that are comparably inexpensive. 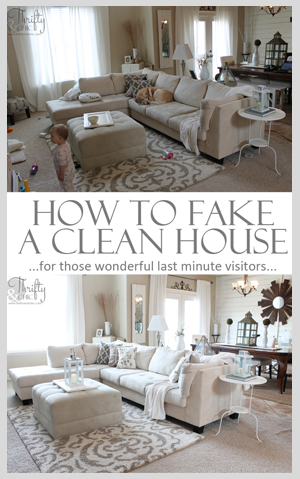 Where did u get the grey and cream rug that is in the picture at the top of the page, before the listed rugs begins? btw love your home decorations. So pretty!!!! Thank you for this post! Rug shopping online is absolutely overwhelming! And it was NOT cheap, like $500-$600 (when I bought it). And, in just one year's time of lots of traffic and a dog in my front room, it does not look so expensive anymore. So which rug ended up in your living room? Did I miss that? I'm shopping rugs for an open area and need 2 that compliment. I love all you chose so now I'm torn. Do you have an idea if number 10 is still available at Walmart? Wonderful post! Thank you for sharing! I have similar to number 16 in my living room! 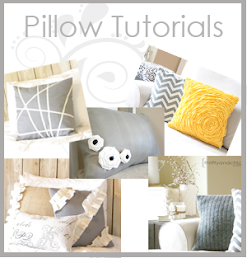 I love how you're designing your home! You are really good at that! 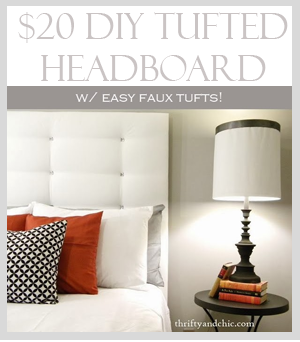 This information on area rugs under $250 so time and money saving. You have taken good efforts to find these for us, thanks a lot for sharing :). That photo of are rug number 11 for comparison is really good design. Nice pictures of you're home. I agree rug shopping can be overwhelming. 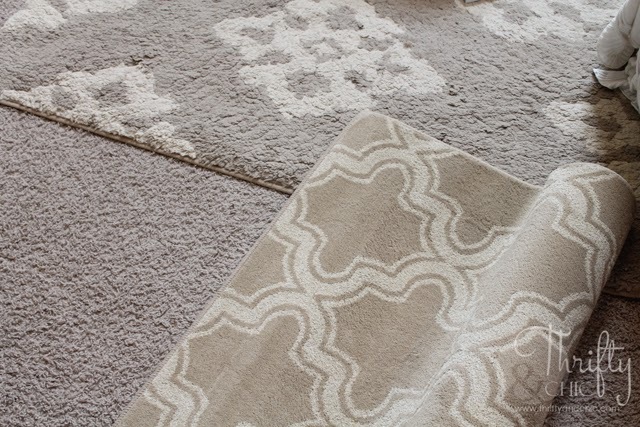 Stop by our showroom located in Miami, Florida, we have so many rugs to choose from they come in different sizes, colors, textures, and shapes. also we have custom rugs available. You're so good at decorating! You are better than some professionals I know! I've though that the picture of your living room is from a catalog, before I saw the caption! You have a beautiful home. 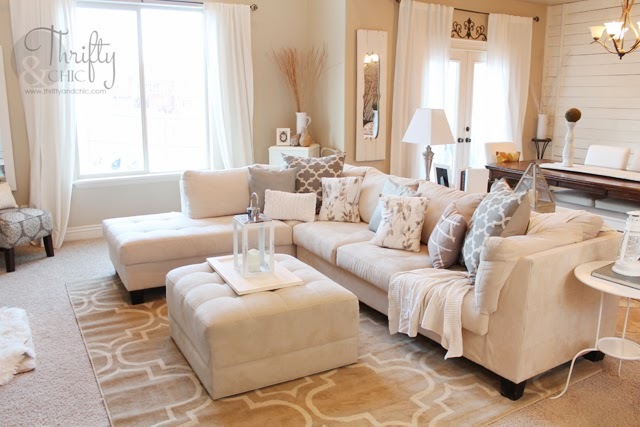 I love how you showed rugs along with your furniture. Sometimes the rug looks totally different when viewed alone. Love ALL the rugs, have my eye on beige and cream for the lounge, would I be able to have it sent to NZ? I love your sofa and have been looking for one like this for a while. Would you mind sharing where did you get it from? Be careful of buying area rugs from Target. Was visiting family over the weekend and they had a beautiful rug in grey and white that looks similar to those shown above. While it looked really nice, this was in a newly built home which they have been living in a short time. This rug was already pilling and shedding like crazy!!! I couldn't stop sneezing and was congested for the rest of the evening - BOOO! In addition, the carpet fuzz was all over everyone's clothes, including the toddler and baby who were playing on this rug. Poor choice in my opinion - if you have a family you may wish to spend a bit more. 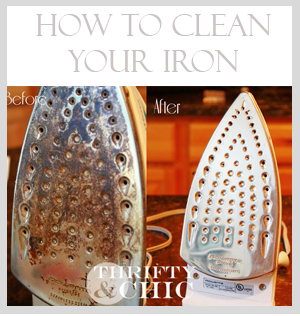 Often when it comes to items like this you truly get what you pay for! Where did you get the armless chair in the corner? Love it and I need something exactly like this! These rugs are excellent! I was looking for Designer Rugs in Melbourne with a wide selection of designer handmade Persian rugs. Thanks for sharing. Keep exploring. hi there! this was super helpful, even if written awhile ago, question: where did you get the grey rug that you compare the beige mohawk to? If anyone needs an area rug, Ikea is definitely the place to go. I got a very thick and plush 5x7 cream rug for 80 bucks last year and more recently, a thin 4x6' grey/white rug for 12 bucks! Awesome. The rug under the chair is really elegant. Even I have ordered a washable area rugs for my dining area.